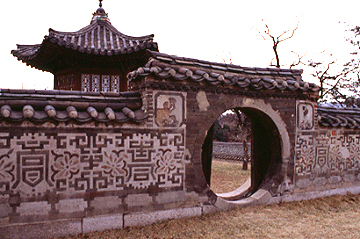 This is the only round gate one can see in Korea, Wolgwangmun in Naksongjae. Designs based on Chinese characters for long life and good fortune ornament the wall. 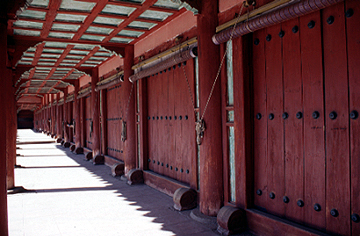 An octagonal two-tier wooden veranda, Sangryangjong, can be seen in the background. This is the Chongmyo shrine, the Royal Ancestral Tablet House. 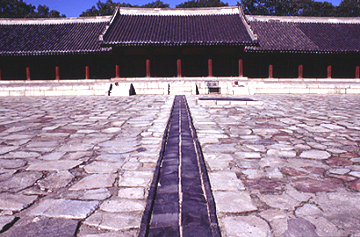 This is considered one of the most sacred confucian sites in Seoul. Inside are the memorial tablets of the Yi Dynasty kings. On the tablets, the names of the kings are recorded along with a long descriptive phrase describing the achievements and glories of that particular king. ..the walkway to the Chongmyo shrine. 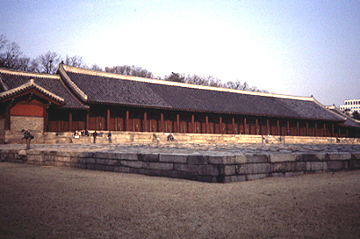 The raised tiles were the walkway for the king to walk on during memorial ceremonies. ..the doors of the shrine. Behind each door is a room housing a single king's tablet and the tablets of his queen and immediate family. 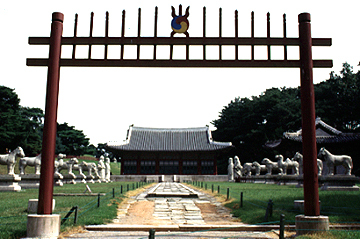 This is the tomb of the last Korean king, Sunjong, who ascended the throne when his father, King Kojong, abdicated in 1907. Sunjong was deposed by the Japanese when they annexed Korea in 1910. He died in Changdok Palace in April, 1926. 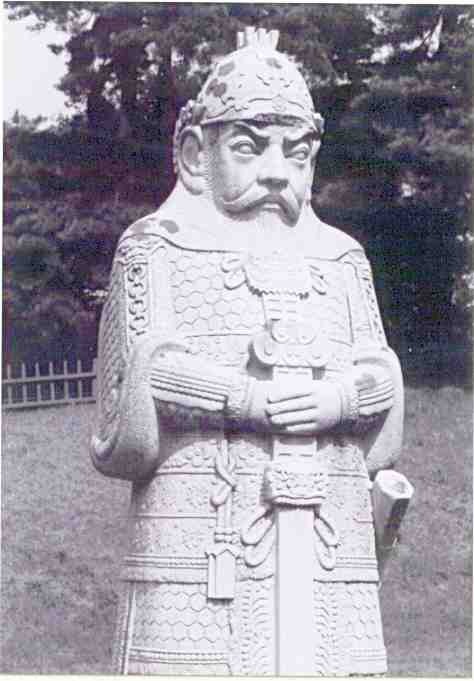 ...the tomb (named Yu-Nung) was built under Japanese supervision, and they did a remarkable job on Sunjong's tomb (since Sunjong was their figurehead, the Japanese made sure his tomb was extraordinary). The stonework of the tomb's statues was all done by Chinese craftsmen. 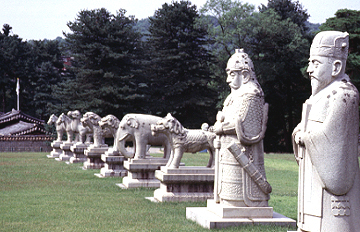 The walkway to the tomb is flanked by two rows of these statues, whose order is: horse, camel, haetae (Korean mythical tiger), lion, elephant, yangma (Korean mythical horse), military official, and civil official. ..this is one of the 'military official' statues. 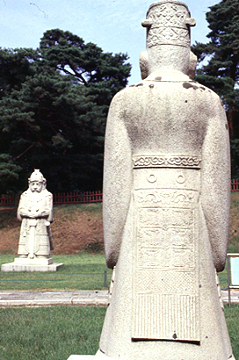 ..these statues are the largest of any of the old Korean royal tombs. 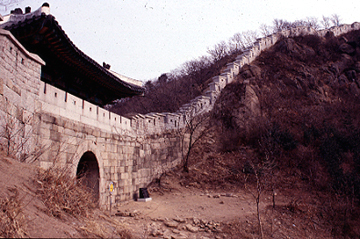 This is the North Gate (Sukchongmun, 'Gate of Silent Purity') of the Pukhan mountain fortress (Pukansansong) that was built in the mountains north of Seoul to provide protection for the kings. 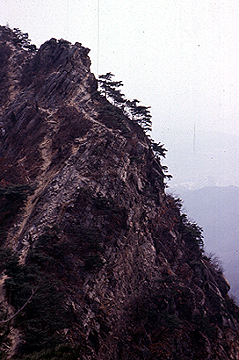 Some jagged rock formations in Pukhan-San, the mountains of northern Seoul.